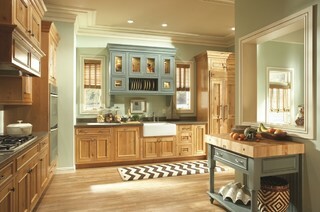 Accent colors make all the difference in a home's palette, adding dimension and visual interest. Your favorite accent colors can take center stage, while others fade into the background, but both are important. 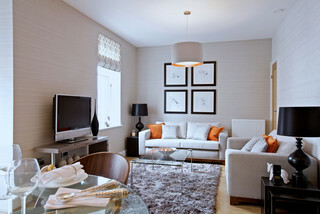 Use accent colors to emphasize certain elements, create focal pieces and draw the eye around a room. Not sure where to start? Here are eight excellent places for splashes of color. Accessories and paint. Sometimes an accent color just doesn't feel right on the walls. This designer painted the window frame over the sink to create an instant focal point, and found accessories in the same hue to show off behind the glass cabinet doors. Cabinet finishes. If you have upper and lower cabinets, paint some of them. A natural wood finish is the predominant hue in this kitchen's palette, but the sage-green upper cabinets draw the eye above the sink. 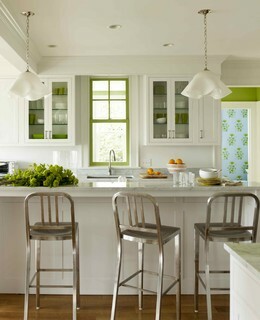 Note how the butcher block island is painted in the same hue for a harmonious design. Upholstery. A monochromatic design can be beautiful, but playing with unconventional colors will give your room a lively look. Choosing playful colors on select pieces of upholstery is a great way to do this. I love how the bright fuchsia on the dining chairs and living room chair ties the two adjacent spaces together here. Contemporary Kitchen by Saskatoon Interior Designers & Decorators Atmosphere Interior Design Inc. Artwork. With the right accent color, dark wood floors and black leather furniture feel less like they belong in a bachelor pad. Use artwork to accent more neutral rooms, like this, since it can be switched out easily for another color or a neutral later on. Tile. 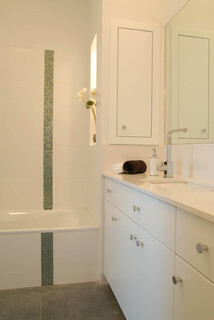 White tile looks clean in bathrooms, but it can feel slightly boring. Find an accent tile in one of your favorite colors and install a decorative strip of it. This colored tile was installed in a vertical band from floor to ceiling for a small but powerful design element. Lighting. Good lighting can make all the difference in how a room looks. Why not take it a step further and use your fixtures to emphasize an accent color? 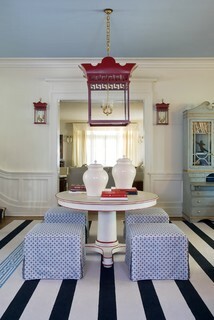 The chic red pendant and matching sconces in this room match a subtle pencil-line detail around the center table, pulling the interior design together. Pillows. A few colorful, well-placed throw pillows could be all the color you need. This is an easy way to add color without a major investment of time or money. 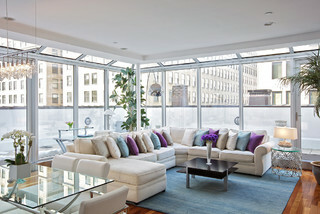 Scatter throw pillows on the floor, sofas or chairs, using colors that connect with the other textiles in the room.